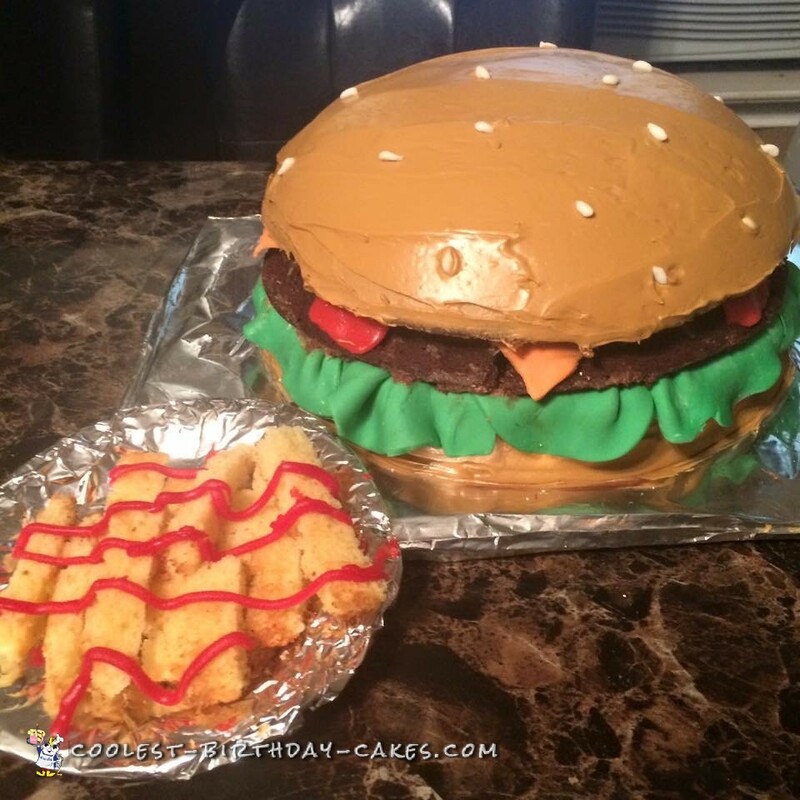 I made this burger and fries cake for my son’s birthday. I first made two round yellow cake for the bun and one chocolate round cake for the meat part of the cake. I then mixed food coloring into icing to get the right color for the bun, using a touch of brown and yellow. The icing for meat patty was chocolate icing, I then used some mini chocolate chips and crumbled them in a sandwich bag and I spread it all over chocolate cake to get a meat look effect. I then used green or coloring on fondant to make the lettuce. I used fruit roll ups for tomato and I used yellow food coloring on fondant to make cheese slice. For the fries I made a small yellow cake in square cake pan and when done I cut it into slices and put them in oven with broiler on for like a minute to get the crispy fry effect. This was the first time ever made this cake. everyone loved it so much I did another one for my work place. The hardest part of doing this was getting the bun part the exact color of an actual bun.